Chinatown Art Brigade co-founder and filmmaker Betty Yu works to protect tenants in gentrifying areas. Wednesday she shares her ideas south of downtown. On Thursday night, a group of artists from Dallas took inventory of their roles in the city’s growth and the ways redevelopment has affected the neighborhoods where they grew up. The setting alone spoke volumes—this panel on art and gentrification in Dallas, the first in a month-long series curated by Dallas Morning News architecture critic Mark Lamster and SMU professor and journalist Lauren Smart, was held inside a business, in gentrified Bishop Arts, that was once someone’s home. In 2013 Spaniards Paco Vique and Javier Garcia del Moral converted a run-down, two-bedroom, one-bath 1940s craftsman home into the bookstore, coffee shop, bar, and casual performance venue known as the Wild Detectives. It’s a friendly host to culturally aware conversations and readings by internationally known authors; sometimes they require a translation from Spanish to English for the neighborhood’s patrons. During the past five years, the place has thrived just off the main drag of the Bishop Arts District where even last week plans for more new residential and mixed-use buildings were announced. More than 50 people crowded into Wild Detectives’ main space, sitting at warmly lit communal reading tables, standing in aisles or crouched on the floor. Panelist Tamitha Curiel, an artist and educator from Pleasant Grove, said her family relocated every year until she was 10, forced to by poverty and displacement. Her work embodies a desire to stay. Curiel, along with artists like fellow panelist Giovanni Valderas, produces art in public spaces aimed at raising awareness of longtime residents who are at risk of being displaced. Their efforts have become more visible thanks to the site-specific works of Decolonize Dallas, to which Curiel contributed by bringing spoken word and images to a DART station in homage of her childhood neighbors in Pleasant Grove, and Valderas’ Casita Triste project. Casita Triste has become a star of local news spots as Valderas (or, sometimes, just the reporter) sits next to giant, sad-faced piñata houses he’s placed all over the city at construction sites for high-rises and in the corners of city meeting rooms. Valderas looked out at new faces on Thursday and hoped the discussion wouldn’t end when the night did. The conversation is a broad one that’s happening well beyond the realm of artists. Activists and public officials alike are wrestling with these tough questions—what policies can the city put in place to protect longtime residents from the increase in property taxes and rents when new development pours in? How can development be managed to encourage mixed incomes and uses? The city of Dallas is even producing its first citywide housing policy, which will attempt to answer these questions. The gentrification panels are happening as the city solicits public comment on this very thing. As much as the patterns of gentrification in Oak Cliff have calcified, there are still victories that prioritize longtime residents. The Dallas Landmark Commission yesterday heard residents’ pleas to protect a mural outside Maroches Bakery on Davis Street in North Oak Cliff. The owner gets another chance to obtain a letter from an arts community member explaining the mural’s significance. While protecting public art is important to those fighting for preservation, directly addressing the scourge of housing inequality in Dallas has become item one. That’s why artist and educator Vicki Meek invited New York artist Betty Yu to Dallas for a discussion called Disrupting Displacement: Art Vs. Gentrification. As a co-founder of the Chinatown Art Brigade (CAB) and an award-winning documentary filmmaker, Yu embeds herself in the efforts of those who use their work to prevent or address displacement. CAB itself was formed at the request of Chinatown Tenants Union. 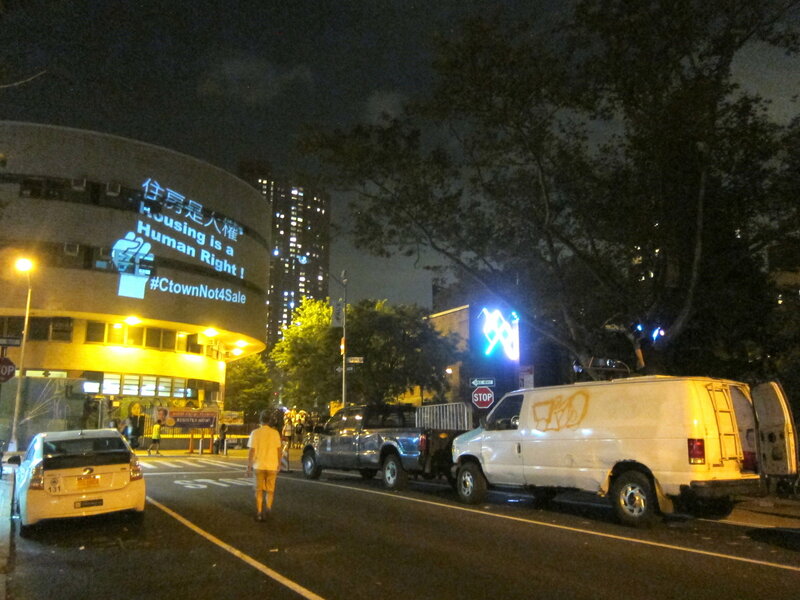 In a multi-year project called “Here To Stay,” the group collects messages from tenants in Chinese, Spanish and English and projects them at night on the sides of buildings where residents who’ve worked late can see them, often in spots visible from the Lower East Side, which shares a plight of displacement with Chinatown. Yu and her cohorts lead place-keeping walks, making sure the original stories of storefronts and people live on. A #ChinatownNot4Sale projection on August 19th, 2016 at M.S. 131 on Hester Street in New York City. As the conversation about art and displacement all across the U.S. bends toward direct civic engagement, Meek and fellow artist Edykah Chilomé reached out to Sandy Rollins, the founder and Executive Director of Texas Tenants Union, staff from the homeless community resource hub City Square, and local artists to participate. The huddle is free, and takes place in the same complex where CitySquare serves low-income and homeless residents, at 610 S Malcolm X Blvd in Dallas.